He’s young, he’s educated and he’s optimistic about his future in the apple business. Brett Schuyler farms near Simcoe in Norfolk County with his dad, uncle and brother, where they also grow sour cherries, corn and soybeans. And although they now have 500 acres of apple orchards, it wasn’t until Brett and his brother Ryan both decided to join the family business several years ago that the Schuylers started to expand that part of their farm operation. Schuyler Farms grow Paula Red, McIntosh, Gala, Empire, Red Delicious, Ambrosia, Idared, Northern Spy, Cortland and Spartan apples. Historically, Empires have been their biggest variety but it is gradually being replaced by Galas as new orchards are being planted, something they’ve been focusing on more aggressively since Brett and Ryan joined the farm. As part of his four year agricultural science program at University of Guelph, Brett’s path took him to Australia on an exchange program where he was able to land a job with the department of agriculture in Western Australia. The overseas experience helped him see the opportunities his family’s operation could offer and made him realize that’s where he really wanted to be. 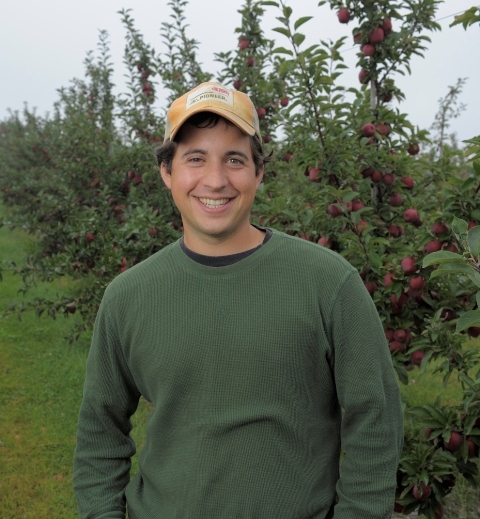 Brett’s main focus is on the agronomy of apple growing, including fertility and pruning decisions, orchard maintenance and decisions related to new plantings. He also takes time, however, to give back to the apple industry, by being involved with the Ontario Apple Growers. He joined the board of the organization this year and has also participated on the risk management and juice negotiation committees over the last two years. “Apples are such a big part of our business so I’ve been wanting to get involved in the industry and help support it to make it more vibrant,” he says. The Schuylers have also long been involved with the Norfolk Fruit Growers Association (NFGA), an organization that stores, ships and markets apples for its members. Brett’s father, Marshall, is the current president and Brett works closely with the NFGA to gather and analyze apple production data to help with decision-making in the orchard. Schuyler Farms sell all of their apples through the NFGA. Technology and the environment are a big focus on the farm. GPS technology guides their orchard planting and soil mapping helps determine which land is best suited to which crop. Their fruit trees, for example, are generally grown on “frost free” sites created from the glacial till that runs through their area, whereas grains and oilseeds are planted mostly on more productive silty clay and sandy soils. An Integrated Pest Management (IPM) program lets the Schuylers, with the help of crop scouts from the NFGA, monitor different insect populations and decide how to best protect their crops against pests. They’re also creating habitats that encourage natural pollinator populations and using tillage techniques that reduce soil erosion and energy use. In the fall, Brett volunteers his time to help out with agricultural awareness activities at the Norfolk Fair. You can see him give a talk on apples and apple growing to grade four students – or you can catch him on Twitter year-round as @brettschuyler. Story by Lilian Schaer, photo by Martin Schwalbe for Ontario Apple Growers.